A dust collector is a device used to enhance the quality of air in your workshop by collecting dust and other loose debris from your work area. A dust collector is an essential device to have in any workshop, home garage, or job site, as it will keep your work area clean and clear, while also making the air around you safer to breath. Not having a dust collector can cause various problems in your work place such as making your line of sight unclear while working, making the air around you unsafe to breath, creating tripping hazards from materials hidden under debris or loose particles. Unfortunately, treated lumber can release a range of toxic chemicals when it is cut and the sawdust enters the air. Having an effective dust collector can eliminate these chemicals from the air as you work. After testing and researching 23 of the top dust collectors on the market the Shop Fox W1685 1.5 horse power dust collector rose above its competitors as the best in its class. The design is compact and comes with wheels allowing you to move it around the shop as needed. It includes a max RPMs of 3450 and collects fine particles with filtration of 2.5 microns. The large bag capacity can handle a volume of 5.4 cubic feet and a suction capacity of 1280CFMs, giving you the filtration needed for clean air in your workshop and enough suction capacity for operating multiple machines. A dust collector can be beneficial to anyone working with wood in a closed environment. Whether it is a garage or a dedicated workshop, having clean air will make the work space safer. Dust collectors can be compact and portable increasing their versatility. They are easy to use and can attach to a wide range of tools that let of dust and debris during operations. They offer an efficient and effective way to keep your workshop clean. Those who would greatly benefit from a dedicated dust collector include: people who participate in DIY projects, engineers, mechanics, electricians, as well as anyone who uses tools or power tools such as sanders, planers, drills, lathes, or media blasters. If you utilize tools that result in dust and debris, you can benefit from using a dust collector. There are several components that make the best dust collectors the first being bag volume. When investing in a dust collector getting one with adequate bag volume will enable you to work through projects without having to constantly change the bags. A large bag will provide you with maximum capacity when clearing up your dust and debris. Another critical quality in a dust collector is the power of the motor. 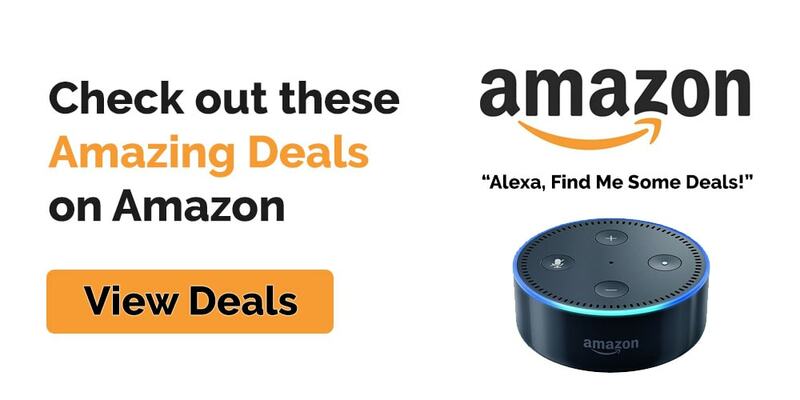 This will determine the amount of dust you are able to collect. Smaller motors will not be able to handle larger particles and will only be able to operate one tool at a time. 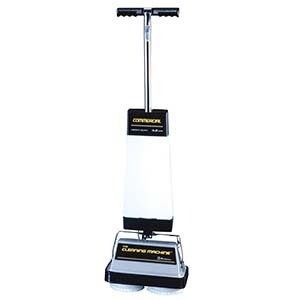 A secure and powerful suction (good suction capacity) will allow you to complete your cleaning and clearing actions at one time and collect all of the materials you need to be cleared. When evaluating the bag filtration system look for anti-clogging features and the amount of microns the bag filters will handle. Some filtration systems will spate large and small particles making them more efficient. This quality makes cleaning out your bag much easier as well as protecting your new dust collector from having larger debris and particles from getting jammed or stuck in your machine. The filtration system will determine how clean your air will be. The smaller the particles it traps the less you will breathe in the air, and the less that will be left for further clean up when you are finished working. We began our research by first conducting a general search for dust collectors. We evaluated the top features and quality’s including durability, bag volume, suction capacity, easy to use functions, bag filtration system, portability and size. Following this we studied tool blogs, forums, magazines, and received expert advice from professionals and hobbyists who used dust collection machines in their day to day work. This allowed us to determine the best brands and models available. We then consulted with confirmed customers and viewed their thoughts and opinions for both set up and long term use and how they held up in real world performance and heavy duty clean up jobs. 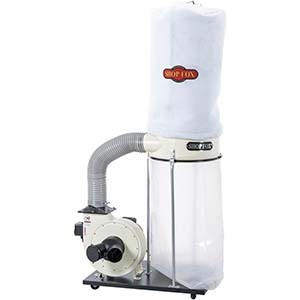 The Shop Fox W1685 1.5 horse power dust collector is crafted of durable materials, and built to collect both large and small debris to ensure your work space stays clean, clear, and keeps your air space more breathable. This dust collector is designed for wood chips only. 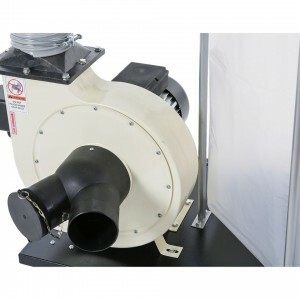 The Shop Fox dust collector comes equipped with 1 ½ HP giving you enough power for daily use in your workshop. The maximum air capacity is 1,280 CFM’s from a 12-inch steel impeller, which allows you the suction capacity to pick up even the largest of particles and debris. The filtration system will capture dirt and dust as small as 2.5 microns. The motor is single phase and will operate up to 3450 RPMs. This dust collector is coated with power coated paint, for a durable and modern looking cover. This feature will resist scratches and reduce fading over time. It can capture a large volume of dust reducing the need for frequent bag changes. 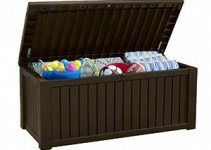 It has the ability to hold up to 5.4 cubic feet. It has a standard bag filtration system to separate the large particles from the small ones preventing your machine from getting stuck or jammed from large particles. 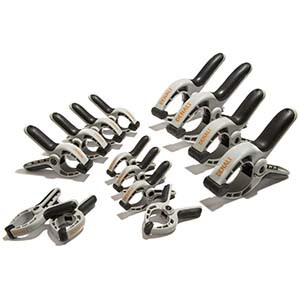 There is a Y fitting which allows you to connect the unit to multiple tools for increased efficiency. One can be capped off if you are only working with one machine at a time. This unit comes with 4 caster wheels that enable you to move it around to a location that is most convenient based on the job at hand. The unit includes a safety switch that prevents accidental starts or unauthorized use. The safety switch includes a lock out key. 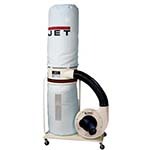 For a dust collector with more power and high levels of functionality the Jet DC 1200VX-BK1 dust collector has features that will improve efficiency with maximum dust collection. This unit features a 2 HP motor and 230 volts, giving you maximum power and suction for the heaviest of debris and particles. It comes with a vortex cone to improve chip separation to significantly increase your bag packing efficiency allowing it to fill to maximum capacity between changes. This device also has the ability to eliminate premature filter clogging so you won’t need to stop and unclog your machine. With a single stage design this machine operates quietly and more efficiently than the traditional dust collectors and has easy to use functions. The motor operates quietly with minimal vibrations. There are four caster wheels making it not only compact but also portable. The bags change quickly and include quick connects for simple installation. As with any power tools care and maintenance are essential for both safety and longevity of the unit. A dust collector can help improve safety by reducing the dust and debris that enter the air of the workshop. We have compiled a list of safety and maintenance tips to keep yourself safe as you use your dust collector. We also provide a list of maintenance tips to keep your new device looking and working like new for as long as possible. Keep your hands and fingers away from the motor and other working parts while your machine is in the on position. Always use eye protection when emptying and replacing bags are airborne debris can impede breathing. If your dust collector requires a power outlet, ensure that you always unplug your machine after each use. Keep your dust collector away from small children. Ensure that your dust collector is properly attached to power tools before placing it in the “on” position. Ensure that you clean and replace bags as needed. Do not over fill bags, as it may cause your dust collector to become jammed. Do not leave your dust collector outside for long periods of time where it may become susceptible to weather damage. Oil and maintain following the manufacturer’s instructions. Dust collectors are extremely useful pieces of equipment that can be used easily and efficiently to keep your workshop clean and keep wood chips and dust for getting in the air and on the floor. The filters can decrease the amount of chemicals that enter the air, giving you cleaner air to breath while working. In addition to providing cleaner air they can play a role in accident prevention, and the protection of your other tools and equipment. 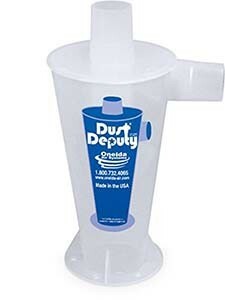 Dust collectors are an investment that will make your shop a safer place to work and reduce clean up time.